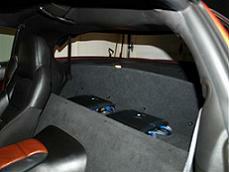 Add bass to your c6 Corvette with our Partition Subwoofer Box. This attractive sub box not only dishes out some serious bass, but the front side doubles as an attractive partion. Add our custom Corvette lettering and you'll have the perfect custom piece. Choose one or two 8" subs and you'll be cranking out some serious bass. 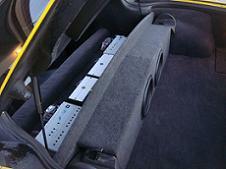 We can also integrate stereo speakers into the front of the box such as 6.5" and 6x9 speakers. Please contact us if you wish to incorporate this option.